Thai Banyan Massage and Spa offers a wide variety of massage services in Honolulu specializing in traditional Thai massage styles, both Northern and Southern. This ancient holistic therapy has been proven to improve ones vitality and wellness by aiding the body to return to a state of harmony, balance, flexibility and good health. 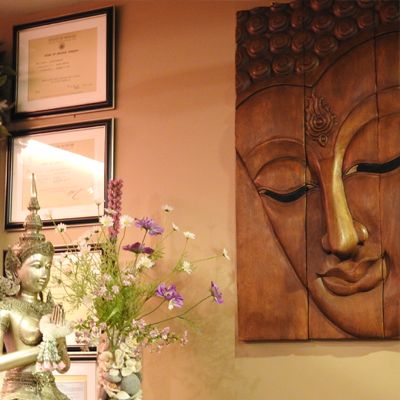 Thai Banyan’s signature service offers both Northern and Southern traditional Thai Massage. The session utilizes stretching, flexing and compression techniques. Northern Thai Massage includes stretching with a slow and relaxing rhythm and Southern Thai Massage includes firm acupressure and vigorous energy line work. $65.00/60 Min. • $95.00/90 Min. Thai Banyan’s Couples Massage can be enjoyed by a couple, friends or family members. Two people share the Thai Banyan massage experience while occupying the same room. Talk, laugh, sleep or just relax with one another while enjoying the Hot Stone, Herbal Compress or Stretching Massage. $130.00/60 Min. • $190.00/90 Min. Thai Banyan offers the popular Swedish Massage which is designed to help calm nerves, detoxify the body, improve circulation and give an overall calming effect to your nervous system. This massage is perfect for stressed, busy individuals who are looking to ease tension and aching muscles. Thai Banyan Massage and Spa offers only professional massage as listed in the menu and never entertains tasteless requests. Focusing on healing treatments, Thai Banyan is a perfect synthesis of quality service and deep respect for natural healing for the mind and body. © 2016 Thai Banyan Massage and Spa. All Rights Reserved.